With its first tablet in about three years, Google is taking aim at the Microsoft Surface and iPad Pro with a machine that is trying to be both a laptop and a tablet, while upping the price of what you think a Chromebook should cost. We used the Google Pixel Slate around the house, for both work and play, and we found plenty to like, and a few things you’ll want to consider before spending between $600 to $1,600. Google nailed the tablet’s build and display: The Pixel Slate’s manageable, but still roomy, 12.3-inch screen is slightly smaller than the larger iPad Pro. And there is a lot of bright, saturated color—the 3000×2000 (293 ppi) LCD screen’s resolution is better than what you’d get on either an Apple or Microsoft’s tablet. The wider bezel conceals a pair of front-facing speakers which help to make the movie or TV streaming experience very nice. Those speakers sound better than they should, given the tablet’s scant 1/4-inch thickness. There is no headphone jack, and while there have been reports of Bluetooth connectivity issues with headphones, we didn’t experience any while streaming an entire Sunday’s worth of NFL playoffs with earbuds from Sony and Sennheiser. During our testing, the Pixel Slate never got unbearably hot . Meanwhile, the build quality feels solid and looks sleek at about 1 1/2 pounds and 1/4-inch thick. The tablet can handle split screens and it was mostly responsive and snappy, though there were a few times there was some noticeable stuttering when moving things around. There are two 8MP cameras (front and back) that can handle portrait mode for wide shots and they work OK in low-light situations and seamlessly with video conferencing apps. When it comes to getting work done, a full Chrome OS functions as it should: that means multiple windows open, popping off your Chrome tabs and Web apps, all with a couple of Android apps going and none of it slowing down. It’s what you’d expect from a Chromebook or while using the Chrome browser. 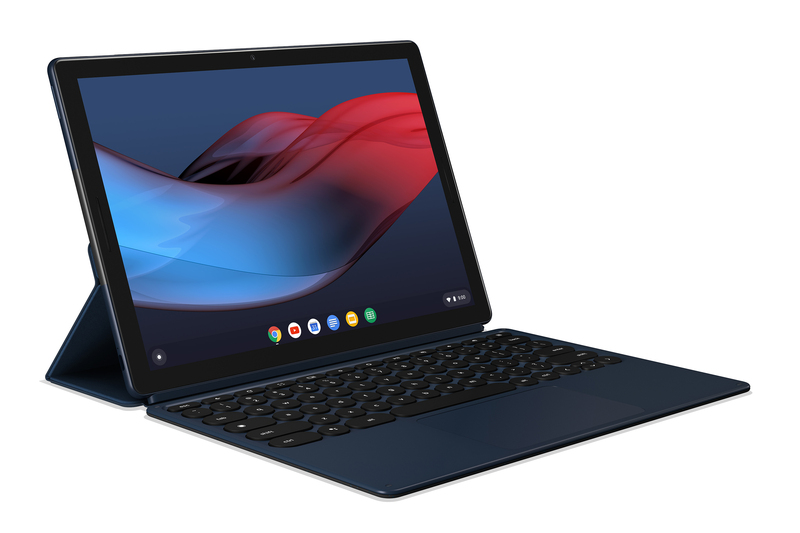 But you’ll have to pick wisely: Google packaged the Pixel Slate as five different builds, using four different processor options, ranging from Intel’s Celeron to Core i7. In each case, the tablet is ready for touch with a nice digital keyboard and the option to have it full size or miniaturized and tucked into a corner for occasional use. Want a real keyboard? Here’s where things get a bit tricky: Google sells the tablet bare, and there’s a $199 Pixel Slate Keyboard that is great, when it doesn’t stink. On a table, the typing experience on the keyboard is smooth with backlit keys that have nice feedback and a build that includes a trackpad (something you’re not getting on an iPad). The tablet docks into the keyboard with magnets and uses more of them to make the screen infinitely adjustable—on your kitchen countertop, desk, or a hard surface at the airport you can do more than knock out a few emails and easily adjust the screen’s tilt to counter any glare. But, put it on your lap and the keyboard has some serious stability and performance issues, like the trackpad clicking when it shouldn’t, and build that’s floppy. If you’re set on having a keyboard for any significant amount of typing, we’d suggest going with the Brydge keyboard which is designed for the Pixel, stiffer, and less expensive. If you need a machine that slips into your existing ecosystem of accessories, or can support them on the road, the Pixel Slate does that, too. The two USB Type-C ports don’t just recharge the tablet. Plug in an external hard drive, printer, microphone, speakers and Chrome will usually recognize them. You can really maximize this with a converter from Type-C to more common USB 3.0. Not a trackpad fan? The Pixel Slate will support a Bluetooth mouse that will right-click like it would on a desktop setup. We didn’t clock the battery life during our testing, but it’ll be enough for a solid Netflix binge session and you can get about two hours of runtime after just 15 minutes recharging. When it comes to apps, you get access to Google Play and Android, and there are limitations here. There are plenty of Android apps that just aren’t designed for the big screen format so the user experience feels like you’ve got a phone’s app stretched out, and you can find it on Google apps, too, if you look hard enough. We love Google’s Snapseed photo editing, but it feels easier to navigate on our iPhones than on the Pixel Slate, even if actually editing the photos with the Pixelbook Pen ($99) is a whole lot easier on the tablet. If you need a machine that slips into your existing ecosystem of accessories, or can support them on the road, the Pixel Slate does that, too. About that pen: It’s essentially the same build from a few years back and you can circle text and photos, then have the Google Assistant search them, which is cool. During our third day of testing, we found that the pen works well and is comfortable to use with apps like Infinite Painter. But we wish the tablet had a mode you could pop into it that would tweak the tablet’s sensitivity while using the pen—too often the part of our hand resting on the tablet while drawing left marks we’d have to go back and erase. The bottom line: So should this be your primary computer? It has a fantastic display, industrial design, capable hardware package, and the ability to play nice with other devices through the USB ports. But we think you’d have to be a real Chrome OS master to make this your only machine, while for the rest of us, it’s a very nice sidekick to your daily computer. We tested the $999 version with Intel’s Core i5, 8GB RAM and 128GB storage.